Dad does something that annoys Mom. When he has clothes that he's worn, but aren't dirty enough to be washed, instead of putting them away, he piles them on top of the chest-of-drawers. It drives Mom crazy. 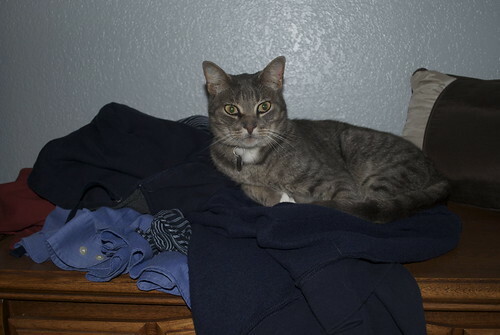 I have found that I can get pretty comfy on top of his clothes. I hope he doesn't mind a little fur.